Facebook Home will integrate all features of the social network into Android. The long-rumored "Facebook phone" is closer to becoming a reality, after the social network on Thursday unveiled Facebook Home, a custom homescreen for Android smartphones. 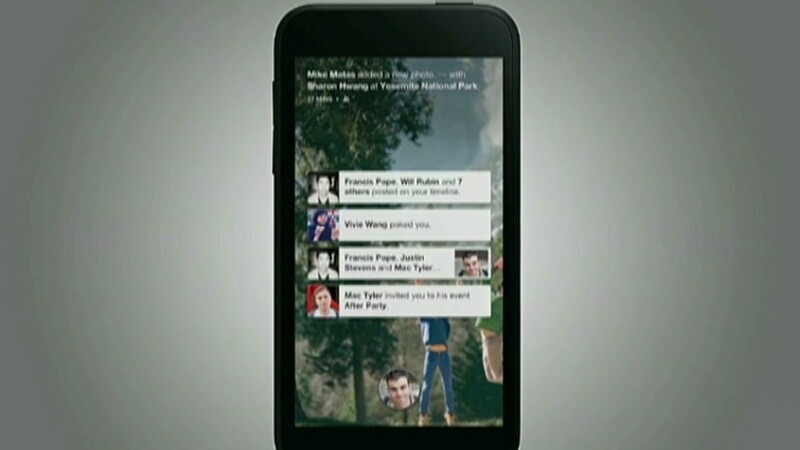 Facebook (FB) Home integrates all of the social network's services into the operating system of Android phones. Instead of having to download and call upon apps to get to services such as Instagram, Facebook Messenger, and Facebook Camera, access to those features is simply baked into Facebook Home. After a user downloads Facebook Home to an Android phone, all of Facebook's services can be easily reached from virtually anywhere on the device. One key example can be found in messaging. The Facebook Home user interface pops up messages on top of any app without taking you out of that app. That's something that isn't really possible on any current smartphone. 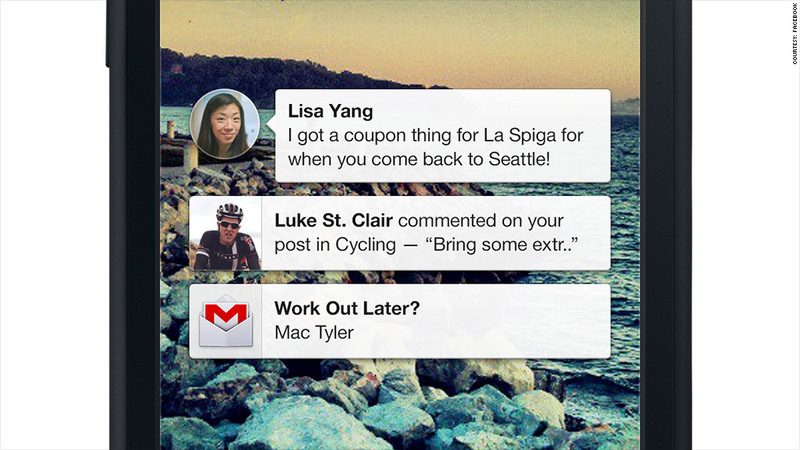 To make the messaging feature even more essential, it will also work with any text messages users receive. So whether a Facebook friend contacts you via Facebook Mail, Messenger or text, you'll get all those messages lumped together in a single conversation. That's one of the more radical tweaks in mobile messaging to come from a major company in years. Facebook Home also emphasizes visual elements of the social network. The crux of the interface is a feature called Cover Feed, which allows you to move through links, photos, and status updates. Little flourishes, such as double tapping any item that floats by to "like" it, shows how Facebook is neatly integrating its features into Android. Notifications -- the kind that cause the red flags to pop up on Facebook.com -- sit on top of Cover Feed. That feature allows you to access the "important" stuff, as Facebook puts it. At the bottom of the screen is a single button that, when pressed, provides quick access to the apps menu, Facebook Messenger, and your last-used app. In the past, Facebook CEO Mark Zuckerberg has repeatedly denied working on any sort of a Facebook phone. In a press conference Thursday, Zuckerberg reiterated that strategy, saying even a "great phone" could likely only sell up to 20 million units, reaching just 2% of the company's 1 billion active users. That's why Facebook opted instead to push out software that isn't really a Facebook phone -- the software is just a "skin" on Google's (GOOG) Android mobile operating system. So Home won't just be tied to a single device or a single manufacturer. Starting April 12, Facebook will offer Home as a download in Google's Play store to select devices -- including Samsung's Galaxy S III and Galaxy S4, and the HTC One X. The plan is to update the app every single month, not only adding more features, but also support for more devices. It's a significant counterpoint to Amazon (AMZN)'s decision to completely strip down the Android operating system and build its own version on top of Android, tailored to Amazon's Kindle Fire tablets. Yet Facebook still unveiled an actual phone on Thursday, albeit one not built by the company. To show handset makers and software developers what a good Facebook Home experience entails, Facebook worked closely with HTC to deliver the HTC First, a mid-range smartphone with a 4.3-inch screen and 5-megapixel camera. While not the most exciting device, it embodies the idea that Facebook Home isn't intended to be cutting-edge technology for early adopters, but something far more universal.